Monty was the result of a cross between Justus McCain of Pincie Creek ("Mac") and Los Barancos Light of the Sun ("Sunshine"). Monty is the foundation behind all of our females. He was a very intense working dog and could be fierce when dealing with disagreeable cattle. He was always controllable, though, and had a strong desire to please the handler. 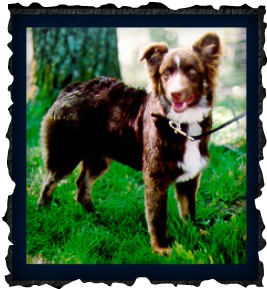 His herding abilities were limited only because we were (and still are) novice trainers and were not been able to devote the time to him that he deserved. That being said, he was not a "chute dog" and did his best work in the open pasture. He wasn't fond of small spaces. In his basic personality, Monty was much more calm and dignified than some of our dogs (such as Gypsy prior to age 6). He was always a reserved gentleman in public and he passed that dignity to his daughter Mischief (and again to her daughter Little Miss). He was very attached to his family and believed he should be sitting in your lap when he wasn't helping with chores. He also believed he should be sitting on your lap when you were swimming which could be a bit unfortunate for all.